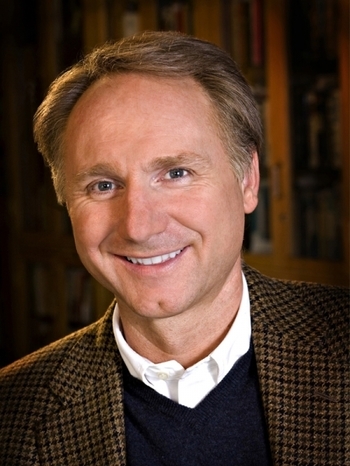 Dan Brown (born 1964) is an American thriller author, most famous for the Robert Langdon series. Not to be confused with Dale Brown or the Dan Brown from Youtube who vlogs, solves Rubik's Cubes, and jumps on pogo sticks. Brown's first three novels went without notice, selling only a few thousand copies. His fourth novel, The Da Vinci Code unexpectedly became a huge international bestseller and made him a household name. Dan Browned: A repeat offender, to the point where he has his own page. And the Trope Namer. Elephant in the Living Room: Major events of the earlier Langdon novels are almost never brought up in later installments, such as the antimatter explosion that nearly leveled the Vatican City in Angels & Demons or an engineered virus rendering a full third of humanity sterile in Inferno.note The latter is particularly egregious, since a major character in Origin. namely, Ambra Vidal, is revealed to be sterile — but as a result of an unspecified childhood illness, rather than Zobrist's virus. It's almost as if every book except The Da Vinci Code is subject to Negative Continuity. Idiot Ball: All of the Robert Langdon novels start with this. A famous man is dead or will die in a high-profile, public, and historically and/or socially meaningful site, and it's going to end up with more death? A powerful organization (FBI, CIA, WHO, CERN, Interpol, DCPJ, etc.) grabs the Idiot Ball first by calling an uninvolved art historian and telling him to fix it. It's quickly taken by that art historian, who runs with it by saying "Sure!" Stock Characters: Most obviously the college students in the Langdon novels. All events in the book (except the prologue) take place over the course of 24 hours. A character is killed off in the prologue by an assassin with a distinguishing feature. note In Origin the victim gets killed early in the story instead of the prologue. Before he dies, he or the assassin leaves an enigmatic clue which prompts the responsible governmental agency to ask for the protagonist's help. The male protagonist is teamed up with a nubile female sidekick. She'll be brilliant, but the protagonist will find a way to make her look just a hair less intelligent than he is. A good example is Sienna Brooks in Inferno. She's got a mind-blowing IQ, but Robert Langdon quickly asserts his perceived greater knowledge by tossing out esoteric anecdotes on Florentine art, and throughout the book, Sienna tells him in one way or the other that he's probably smarter than she is. A shadowy antagonist is set up as the Big Bad but will turn out to be a Red Herring. The character who is the most friendly and helpful to the protagonist will turn out to be the actual Big Bad manipulating everyone behind the scenes. The protagonist and his female sidekick race against time through iconic landscapes chasing a series of clues. At the end, there will be confrontations with the assassin and Big Bad, one of which will always be intentionally anticlimactic. Paradoxically, there will also be extended scenes where everyone sits around to lecture each other on historical minutiae. Any given point stands a good 40% chance of being made up. The story will always involve a conspiracy that is much weaker or more mundane than it looks. The plot will often spend the first third convincing the public/experts that some strange conspiracy is true. After this has been accomplished, the heroes will discover that the conspiracy is false after all, and then convince everyone that they shouldn't have believed them in the first place. The protagonist and the sidekick hook up in the end, and there's a new female sidekick for every book. One of the chapters will always be slightly "odd" as a dramatic/artistic gesture. In the Langdon novels, he wears a rather unfashionable outfit of chino pants, a dark brown turtleneck, a Harris tweed jacket, and an old limited edition Mickey Mouse watch. He hates wearing anything else. His jacket and/or watch will become a MacGuffin at some point. Viewers Are Morons: Many critics have noted that he frequently explains things that are common knowledge, like saying "19th century German composer, Beethoven" when anyone reading would know exactly who Beethoven is.